Debt-free holidays are possible - and way more fun! This social card displays 10 ways to save for a much-needed holiday. There is space provided at the base of the image to add your call to action and details. This image is provided in jpg format. To copy the image, you must be logged in (purple button at top of screen), click on View button, wait until the image appears on your screen, right-click on the image and "Save image as" to your computer. 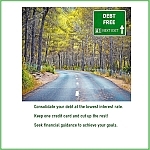 3 quick tips to use as a reminder on how to reduce debt. Space is available at the base of the card to add logo and/or contact details.